LAHORE: The participants of a multi-party conference (MPC), hosted by the Pakistan Awami Tehreek (PAT) on Saturday, added former prime minister Nawaz Sharif to the list of those responsible for the Model Town incident, and pledged to oppose another ‘National Reconciliation Ordinance’ (NRO), or any other relief, offered to grant him immunity from prosecution. The gathering, which included leaders from the Pakistan Peoples Party (PPP), Pakistan Tehreek-i-Insaf (PTI), Muttahida Qaumi Movement (MQM), Jamaat-i-Islami (JI) and Sheikh Rashid’s Awami Muslim League (AML), also agreed that provincial assemblies should pass resolutions calling for the resignation of those allegedly involved in the June 2014 incident that resulted in the deaths of at least 14 PAT workers. The resolutions are meant to ramp up the pressure on the embattled Pakistan Muslim League-Nawaz (PML-N). The PPP, an increasingly vocal PAT ally of late, can easily get such a resolution passed in Sindh, while the PTI-JI coalition in Khyber Pakhtunkhwa can do the same. The 13-party meet extended the deadline for the resignation of Punjab Chief Minister Shahbaz Sharif and Law Minister Rana Sanaullah to Jan 7, and also called for the hundreds of Punjab government officials — implicated in the Model Town incident in one way or the other — to resign in the first week of 2018. Justifying the decision, PAT chief Tahirul Qadri said that the earlier deadline was issued unilaterally, “but since other parties have joined the struggle and own the deadline now, they needed time to make preparations of their own, therefore the extension”. Jointly signed by the heads of all delegations and later jointly read out by PTI’s Shah Mehmood Qureshi and PPP’s Qamar Zaman Kaira, the 10-point joint declaration also envisioned the creation of a steering committee to strategise in case Shahbaz Sharif and Rana Sanaullah did not resign. 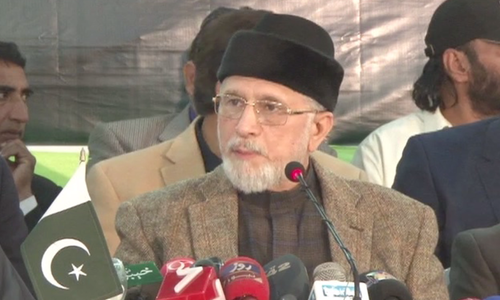 “This committee would meet immediately after the deadline [to resign] expires and will announce the protest plan, which will be owned and joined by all the parties present,” Mr Qadri told a post-meeting press conference. No party head — except Sheikh Rashid and Mr Qadri himself — attended the meeting. MQM leader Farooq Sattar came, but left early; while the JI was represented by Liaquat Baloch, who has been looking after party affairs since party emir Sirajul Haq proceeded abroad. The MPC declaration also noted that the PML-N government had disturbed “the very basis of the Muslim faith by tinkering with the Khatm-i-Nubuwat text. Nawaz Sharif and his party are responsible for this legal terrorism and have not exposed those who committed the act. After this change, the party has lost the right to rule. This moot warns the PML-N that this dispute will stay alive as long as they do not punish the culprits”. The heirs of those killed have spent three and a half years struggling for justice, but in vain. Not even one of the 125 policemen involved in the incident have been punished, and this only shows that as long as Shahbaz Sharif, his law minister and those behind the incident stay in power, justice will hard to come by, the declaration said. The Punjab government had formed two joint investigation teams (JITs) after the incident, but neither made the heirs of the deceased a party to the investigation. “The chief justice of Pakistan should form another JIT, to be headed by a Supreme Court judge, to reinvestigate the entire incident,” the declaration said. The PPP was represented by Qamar Zaman Qaira, Sardar Latif Khosa and Manzoor Ahmad Wattoo. Shah Mahmood Qureshi, Jehangir Khan Tareen and Shafqat Mahmood came to represent the PTI. Mr Sattar’s early exit raised eyebrows among the media. Mr Qadri tried to satisfy reporters by saying: “The MQM delegation had to leave early because of some pressing issues, but our decisions have their blessings.” However, their absence from the composition of the steering committee, where every other party found a berth, led to suspicions that all was not well on the MQM front. Women’s Day 2019 Quotes: 11 Inspiring Lines from Powerful Women Who Run the World!